Jean-Marc Gales: "Within the next nine months there will be a couple of announcements of product enhancements that will make the heart of any Lotus enthusiast beat faster." Jean-Marc Gales took over in May as Lotus CEO, filling a post vacant since Dany Bahar was fired in 2012. The struggling British sports carmaker lost 159 million pounds (203 million euros) in its fiscal year ended March 31, 2013 and 115 million pounds in fiscal 2012, according to the Malaysian-owned company’s most recent financial records. Lotus is axing up to 325 of its 1,215 employees worldwide to help cut costs and stem losses. Gales, the former No. 2 at PSA/Peugeot-Citroen, told Automotive News Europe Correspondent Nick Gibbs his next task is to add more dealers. What are your priorities for Lotus? The focus has been on the commercial side, making sure we sell more cars, provide better coverage via our dealer network and develop a more precise marketing program. We also have restructured the whole company and given program management more power. In the first four months of this financial year [which started April] we sold 46 percent more cars, but that’s still not sufficient to guarantee our future. We need to continue to reduce costs and we are fully aware of the hardship that brings for our workforce. Many people are passionate about Lotus cars. Why doesn’t that translate into more sales? One reason is that we don’t have enough dealers, even in the UK. There is no dealer in London, and nor is there in Paris, Madrid, northern Italy, Hamburg or Berlin. More dealers drive more sales. We have opened nine new dealerships worldwide over the past six months and I would not exclude having 20 more in this financial year. MAIN CHALLENGE: Cut costs, end losses and keep an aging model range sufficiently fresh to increase unit sales to 3,000 by 2015 from 1,232 last year. Is Lotus only about sports cars or can you extend the brand to other segments? Lotus is about pure driving. We decided to get back to the philosophy of our founder, Colin Chapman, that lighter and simpler is better. There are three characteristics of the product: dynamic excellence, lightweight efficiency and distinctive styling. All our new products will reflect this – and you can attach these values to any segment you can imagine. Do you need a new platform? We will stick with the aluminum tub chassis, which is a very modern construction, but we will make it easier to get into and out of and make it even more rigid. Within the next nine months there will be a couple of announcements of product enhancements that will make the heart of any Lotus enthusiast beat faster. How long will it take to return Lotus to profit? We will return to profitability in the very foreseeable future. That’s absolutely the target. 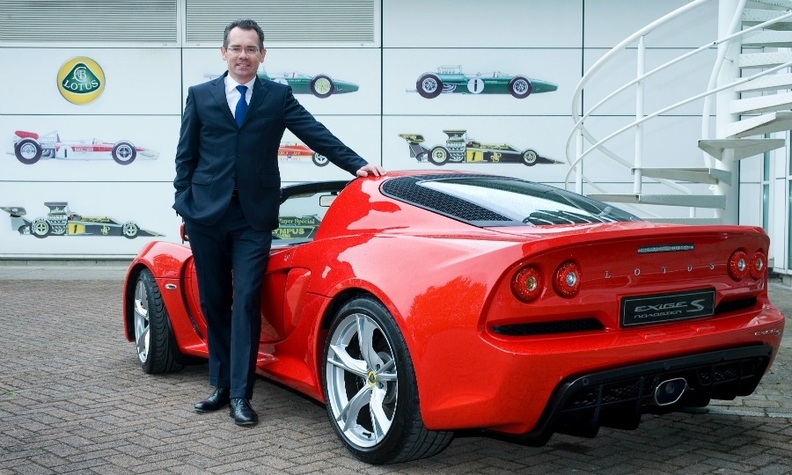 The last Lotus CEO, Dany Bahar, unveiled five dramatic concepts in Paris four years ago. Did anything survive from them? No – nothing. They were not ready for any form of serious production. Are you still developing a V-8 engine? No. We cannot afford to build our own engines so we will continue to use engines developed by volume manufacturers and make them better. We are happy with our current relationship with Toyota. What attracted you to Lotus? I’ve known Lotus almost since I could walk. The Elite launched in 1974 was my dream car at that time. It’s an iconic brand that has a real heritage. I really believe you can build a lot with the brand, but with a dose of realism. It was the challenge of realizing that potential that attracted me.